Ever wanted to go on a whirlwind trip around Europe soaking up the tasty delights of Italy and France to the Swiss Alps and Turkey? In the space of just two hours or so? If only apparition or teleportation was a thing. But your taste buds can with Chef Ashley Davis’ European Road Trip menu at Copper Pot Seddon. After 10 years abroad traveling and falling in love with the cuisine of Europe, Chef Davis brings to Seddon old school European cuisine created with quality and seasonal Australian produce (psst, the truffles are coming back soon). There’s something to be said about the gorgeous dining space, filled with European charm and a touch of Melbourne (check out the feature wall art). By day, it exudes relaxed and casual comfort, transforming into a sleek, elegant and buzzing hub in the evenings. First up, we visited Spain with the white anchovies and Padron peppers ‘a la plancha’ appetisers. Anchovies normally send me running fast and far in the opposite direction thanks to their strong, fishy flavour but as it turns out can be quite tasty when paired with equally punchy ingredients. 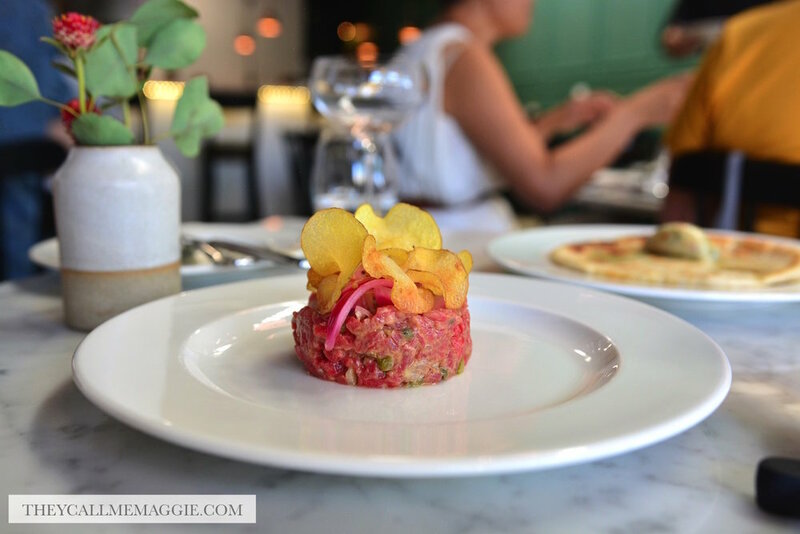 We visited Germany next with their silky flank steak tartare; featuring a flavoursome blend of herbs and horseradish mayo. Bites of pickled onions and crispy potato crisps added a textural oomph. Whilst here, we also enjoyed the charred, airy light flat bread, although the accompanying schmaltz, a fatty concoction of duck fat, pork fat and crackling, was not quite for the feint hearted. 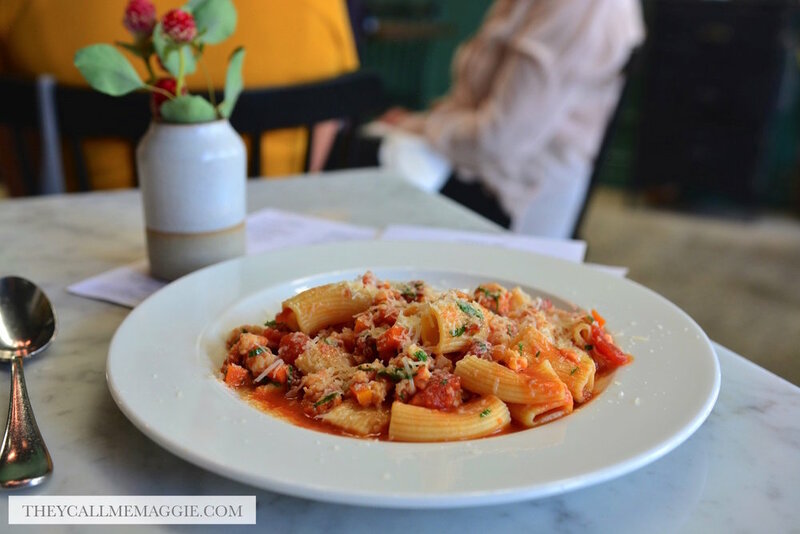 We were next served a plate of revamped Italiano with the King prawn bolognese; fresh house made rigatoni loaded with juicy bites of prawn swimming in a sensationally flavoursome fish stock and tomato bouillabaisse base. Hearty and moreish but not at all heavy. The slow braised Flinders Island lamb rump transported our taste buds to Greece and Turkey. We finished up in Italy and the Swiss Alps with the Chocolate delice; a deconstructed rendition of a Kinder Bueno chocolate; with flavours and textured nailed to a T. Tasty. Tantalising. One of my favourite dishes on the day, ending our lunch on a beautiful sweet note. Your trip to Europe awaits. Leave the decision making in the chef’s more than capable hands, sit back, and enjoy. White anchovies - with shallot, parsley and aioli. Padron peppers ‘a la plancha’ - with aioli and crisp salt bush. 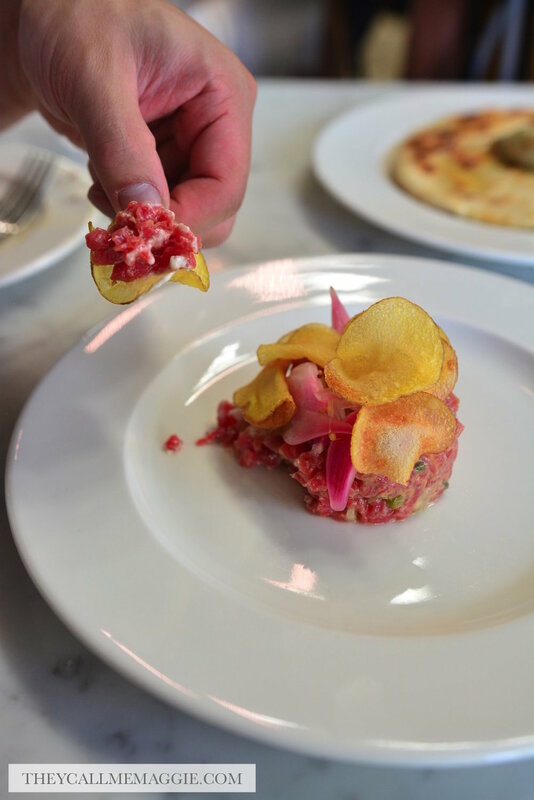 Steak tartare - with horseradish mayo, sweet onion and potato crisps. Charred flatbread - with schmaltz. King prawn ‘bolognese’ - with tomato, oregano and house made rigatoni. Flinders Island lamb rump - with sweet potato, eggplant and spiced yoghurt. Chocolate delice - with hazelnut and feuilletine crumb. Disclosure: I dined as a guest of Copper Pot Seddon. All opinions expressed in this post are based entirely on my experience and observations made during the time of my visit.